The government appears in no mood to pay heed to a Parliamentary panel�s key recommendation that the state should stay away from acquiring land for private businesses. The month of May has been exceptionally good for Haryana, academically speaking. If on May 4, Shena Aggarwal of Yamunanagar topped the civil service examination, today Arpit Aggarwal of Faridabad stood first in the IIT joint entrance examination (IIT-JEE). Several protected persons in Punjab have got more security guards allocated to them than they are actually eligible for. Many of them have even sublet these security men to industrialists and real-estate developers. According to an ongoing reassessment of the threat perception to the protected persons in the state, several politicians and police officers have been found to have sublet their security guards to businessmen. All is not well in the National Conference (NC) and the Congress alliance in Jammu and Kashmir. Leaders of both parties are back to attacking each other after a �ceasefire�. Their weapon of choice: pinpointing �bungling� in departments held by the coalition partner. The National Conference and Congress have been running a coalition government in the state since January 5, 2009. Kolkata Knight Riders co-owner and Bollywood superstar Shah Rukh Khan was today banned by Mumbai Cricket Association for five years from entering the Wankhede Stadium for misbehaving with its officials in an IPL match here. 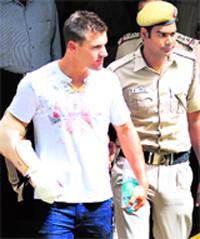 Incidents at a private party at a five-star hotel in Central Delhi last night led to the arrest of Australian cricketer Luke Pomersbach for allegedly molesting a woman and severely injuring her fiance.